Let’s be frank. It’s hardly a secret that sugar is bad for you. Most of us who consider ourselves health conscious strive to limit our daily consumption of refined sugar, or sugar in general, which is why artificial sweeteners are added to many foods, beverages, dairy products and baked goods. I am not fond of those as all of you know. But then there are natural sweeteners, the king of which is stevia. It’s in a bazillion food products, many of which target people with diabetes or obesity. Supplements often contain stevia, it’s everywhere! As a plant-derived sweetener, it sounds harmless and wonderful. For most of us, it’s a fantastic alternative. I am not opposed to stevia, or extracts from the stevia plant, but like any plant-derived product (or drug or food or dye, or anything), you can be allergic! Maybe your throat itches or seizes up when sipping a stevia-sweetened latte or when you chew on sugar-free gum. Maybe you sneeze or your lips itch. As it turns out, there is a small proportion of the population has a stevia sensitivity. It’s all related to a very common allergen: Ragweed! Are you allergic to ragweed? If you are, then you are also susceptible to sensitivities from consumption. Also, just an FYI, pure, unrefined whole stevia leaf powder (in its raw natural state before it’s put into foods) is a very light green powder. This is a completely natural sweetener. However the white stevia that many food manufacturers incorporate into our “Sugar Free” food supply might be a chemically-altered, nutritionally-naked, bleached version of stevia, and further, it’s likely to contain GMO fillers. So it’s possible a small percentage of you that are ‘sensitive’ to stevia are reacting to those chemicals or bleaching agents that are used to turn the green stevia into something that looks like real sugar, which is white. People generally like “white” stevia because it’s pretty and it reminds them of regular table sugar which by the way, is also stripped of minerals and then bleached. While it’s exploded in popularity in recent years, the stevia rebaudiana plant has been used for centuries in South America as a natural sweetener and medical treatment. Residents of Brazil and Paraguay have long used it to sweeten their yerba mate tea, or to provide relief for burns and even stomach pain. Some cultures utilize it as a natural contraceptive, however, I don’t agree with that method. In another animal STUDY conducted in Pakistan in 2018, scientists concluded that stevia could help with cholesterol and lipid profiles in general. Stevia is an herbal treatment (potentially) for people with chronic kidney disease. There was a 9-month long human study recently conducted in India, using stevia. The results were positive and provided validation for other studies that have shown stevia’s medicinal benefits in diabetes, and hypertension, two inevitable complications of kidney disease. Biomarkers such as serum creatinine, uric acid, microalbumin, fasting blood sugar and post-prandial blood sugar were all evaluated. The conclusion was that stevia herb could improve some of these biomarkers, suggesting stevia as an adjunctive remedy for someone with chronic kidney disease. You don’t have to supplement with this, it could be as simple as using the sweetener in your oatmeal or tea. Naturally, if you have a serious condition such as chronic kidney disease, it’s crucial for you to ask your practitioner before self-treatment. Why is this relatively obscure plant a multi-billion dollar business? Because it’s sweet and natural, that’s why. It does not contribute to dental caries like sugar, and in fact supports oral microflora health. Stevia is two hundred times sweeter than table sugar, contains almost no calories, and won’t adversely affect your blood sugar when consumed. Why some people find that stevia has a strong aftertaste, the plant is becoming increasingly common sweetener in ‘healthy living’ processed foods. Not all stevia available today is the same, and understanding the differences will help you know whether you’re putting yourself at risk of an allergic reaction. Below are the three main types of stevia and what they mean for its quality. As stevia’s least processed form, green leaf stevia is made by drying the plant’s leaves and grinding them into a fine powder. Because it isn’t concentrated, green leaf stevia is only ten times sweeter than table sugar. Stevia extracts are a concentrated version of stevia that seeks to maximize its potency, and therefore its sweetness. To qualify as a pure stevia extract, the sweetener must be composed of at least 95% leaf. As the name for stevia extracts that are blended with other ingredients, altered stevia blends can contain a wide range of ingredients that aren’t always disclosed on the label. It’s usually not clear how much actual stevia these blends include, and the disheartening part is that some blends have as little as one percent stevia, the rest is filler. For sure, not all stevia products are created equal. There’s a tremendous difference between powdered stevia leaves and a heavily refined (altered) product that contains only trace amounts of the herb. If you’re allergic to ragweed, you’re going to react most intensely to the powdered stevia green leaves for obvious reasons. Compounding the confusion, “counterfeit” stevia is becoming a concern in the food industry. These are products that claim to have more stevia than they actually do in reality. There are food products that are laced with potentially dangerous ingredients like acetonitrile (a nervous system toxin). This lack of consistency and accountability from food makers partly explains why the FDA has been slow to endorse stevia as a sweetener in everything! At the time of writing, October 2018, only stevia extracts can be put into food, not the naturally green powdered leaves. According to medical experts and well-documented reports, many people experience a sensitivity upon consuming stevia-sweetened products. Dairy is being sweetened with stevia quite frequently, and you wouldn’t expect it in some places like yogurt. In 2016, we saw 273 different dairy products launched world-wide (with stevia in them) and of those, 70% were yogurt. If you react to yogurt the way you do to pollen, it’s from the stevia. In one online account, Korin Miller writes for Self.com that a few bites of a stevia-sweetened ice cream triggered a sore throat and coughing fit. One of my friends is so sensitive to stevia that she sneezes and her throat tightens up slightly whenever she eats or drinks a product with stevia. She’s told me that she has an internal sensor for it, and can tell if stevia is in something even if it’s not disclosed on the label! The problem is in the genetics. Stevia was born into the Asteraceae family, or “Aster” which essentially means that stevia is genetically kin to marigolds, daises, chrysanthemums, dandelion, lettuce, safflower, sunflower, artemisia (wormwood), artichokes, endive, and, most importantly, ragweed. This is a botanical family that allergy-prone individuals need to stay away from. This is a botanical family that allergen-prone individuals have to stay away from. In fact, there’s an estimated 23 million Americans who suffer from ragweed-triggered hay fever. Not all of those people are sensitive to stevia, but some of you are and may not have realized it until just now! Pollen from the ragweed and pollen from the stevia plant contain very similar proteins as part of their genetic make up. This means that there’s a possibility of “cross-reactivity” between the two plants. Dr. Vaishali Mankad wrote a good ARTICLE about cross-reactivity and various different foods, shellfish and nuts. CLICK HERE to read her article if you’d like more information. Once the stevia protein passes through your gut, and gets absorbed by your bloodstream, it might get mistaken by your immune system and shot down! Your body might mistake it for the ragweed protein (because they’re so structurally similar), and then you’re faced with miserable allergic symptoms. So, even if you aren’t allergic to stevia, your body may react as if you were, simply because it confuses it for a compound that you ARE allergic to. In other words, your immune system sees these similar proteins as a sign that the compounds are the same, and it responds with allergic symptoms accordingly. Specifically, people with pollen allergies sometimes experience itching or tingling around their mouth and throat when they eat raw fruits and vegetables with similar proteins to their allergy. It’s interesting to note that cooking these foods breaks down their proteins and stops the allergic reaction from taking place. Speaking of allergies, it’s a good time to mention that I’ve written an article regarding, 10 Natural Solutions for Allergies and Sinusitis. If you’d like to read that, CLICK HERE. While the research is still forthcoming, initial reports show that stevia might have similar allergen effects for people who are allergic to plants within the Asteraceae family. One Japanese STUDY called attention to two cases of life-threatening throat constrictions (anaphylaxis) in infants who were exposed to stevia extract, one from chewing the leaves, the other from drinking a stevia powder blended in water. Asteraceae allergies can cause an oral allergy syndrome, also known as pollen food syndrome. It can cause other food allergies, especially to bananas and cucumbers. If you are NOT allergic to cucumbers, I’ve written an interesting article entitled, 9 Cool Things to Do With Cucumbers. Additionally, if you have ragweed allergies (hayfever) it’s also possible to have a cross sensitivity with sunflower seeds, melon, zucchini and chamomile. For this reason, some experts recommend that people with known allergens within this family avoid consuming stevia. But don’t get alarmist. There’s actually not that much supporting evidence that stevia will trigger those extreme anaphylactic allergic reactions, so long as you consume it in its refined, processed form like an extract (as opposed to the more raw green powder that you get from grinding up plant leaves). Besides, even if you you’re sensitive to the commercial sweeteners (the extract), you’re most likely to only experience a mild annoying irritation as opposed to full-blown anaphylaxis. That’s because purified stevia products are stripped of all the plants compounds (including the stronger potential allergens in the plant) during the refining process, which makes them relatively safe for allergy suffers. Some brands actually add dextrose to the formula, along with the stevia extract. This can spike blood sugar. So to be clear, and this is rather ironic but it’s the minimally processed green leaf stevia that might pose the most significant risk of triggering reactions. Even so, stevia irritations aren’t common with the general population, so you might still be symptom-free. Yacon Syrup – This popular sugar alternative has potential for promoting weight loss and helping with kidney function. Yacon syrup is extracted from the roots of a yacon plant (Smallanthus sonchifolius) which is native to South America. Monk Fruit Extract – These fruits resemble melongs. Long used in Chinese medicine, monk fruit extract is the perfect coffee sweetener, as a little goes a long way. Monk fruit sweetener is created by taking out the seeds and removing the skin of the fruit, mashing the fruit, and collecting the juice. The fruit extract, or juice, is about 150 – 200 times sweeter than sugar and contains zero calories per serving, meaning a very small amount provides a lot of sweetness. Blackstrap Molasses – While one tablespoon will set you back 47 calories, molasses has a complex sweetness that packs in an impressive amount of vital vitamins and nutrients per serving. It’s a good source of iron too. Blackstrap molasses is a byproduct of sugar cane’s refining process. Sugar cane is mashed to create juice, and then boiled once to create cane syrup. A second boiling creates molasses. … Blackstrap molasses contains important nutrients such as iron, vitamin B6, calcium, magnesium and selenium. Chopped Dates – Add some sweetness to your dish without sacrificing fiber by relying on dried, chopped dates. Delicious! If you’ve ever eaten stevia-sweetened foods or beverages, perhaps with your diet, then it’s possible you have noticed strange or uncomfortable side effects from the trendy sweetening agent. If you would like more alternatives to sweeteners, or have an interest in diabetes and weight loss, check out the reviews and consider grabbing a copy of my book, Diabetes Without Drugs – The 5 Step Plan to Control Blood Sugar and Prevent Diabetes Complications. How can you tell if you’re reacting badly to stevia? Common symptoms of cross-reactivity include hives, dizziness, coughing fits, temporary shortness of breath, and a difficult time swallowing. If this sounds like you, I recommend visiting a board-certified allergist for testing and cutting out stevia from your diet until you get some answers. 1. Try it in very small doses until you know either way. 2. Keep a food diary or log if you eat a lot of stevia-containing foods or beverages. Note how you feel immediately after consumption. 3. Don’t over do it, even if you are okay with stevia. Sometimes there’s a threshold that your body tolerates, and once you cross it, you stumble. Like every good thing, too much is bad. The FDA states that an acceptable daily level is 4 milligrams per kilogram of body weight, so plan your meals accordingly and if you supplement, keep this number in mind. 4. Stick to high quality purified stevia extracts and supplements. 5. Avoid stevia-sweetened foods that have other ingredients in it, which honestly is very hard to do. If you scan up you’ll see that there are “Altered Stevia Blends” which as the name implies, contains ingredients that are blended into the stevia, and thus not always disclosed on the label. It’s usually not clear how much true stevia these blends include, and some have as little as 1%. 6. Avoid any food or beverage product that contains other ingredients that you might be reacting to, for example artificial colors, sweeteners, MSG and “natural flavors” or “natural spices” which is kind of like code for MSG. If you’re sensitive to any of those, then you can’t deconstruct if it was the stevia or these other ingredients. As long as you take these precautions, you should soon have more clarity on whether or not you are one of the sensitive folks that has an adverse reactions to stevia. I would not recommend taking an antihistamine before eating stevia-containing foods. It sounds logical on paper, but do not do that. Your body is still reacting, you’re still producing leukotrienes and other allergy-related compounds, even if you try to dampen down the histamine response. If you’re allergic or intolerant to stevia, simply stay away from it. I recommend cutting out stevia from your diet until you get some clear answers and visiting a board-certified immunologist for testing. I was asked recently, if it is true that ALL sweeteners (aside from their caloric content) have the same effect on the brain, and act as a stimulant? In other words, will a person be able to tell the difference between the sweetener ingested, and try to mitigate the biochemical reaction to control the glucose spike. Sugar is a stimulant to the brain, it’s a fuel your brain needs. I’m not opposed to natural sugar, I like it. Your body understands what to do with it. It does cause a blood sugar spike, and resulting insulin release. Stevia, on the other hand, doesn’t generally cause any noticeable spike in blood sugar unless it’s combined with other sugars (including dextrose). Stevia won’t really wake up your brain though, not the way real sugar does. If you are among the millions who are fine with stevia, and you enjoy the taste, count yourself among the lucky because this versatile sweetener is an excellent way to satisfy a sweet tooth without indulging in refined sugars with a high glycemic index. It has incredible medicinal benefits, as many other herbs do, and I personally think it’s a nice alternative to artificial sweeteners which I am completely opposed to in all circumstances. 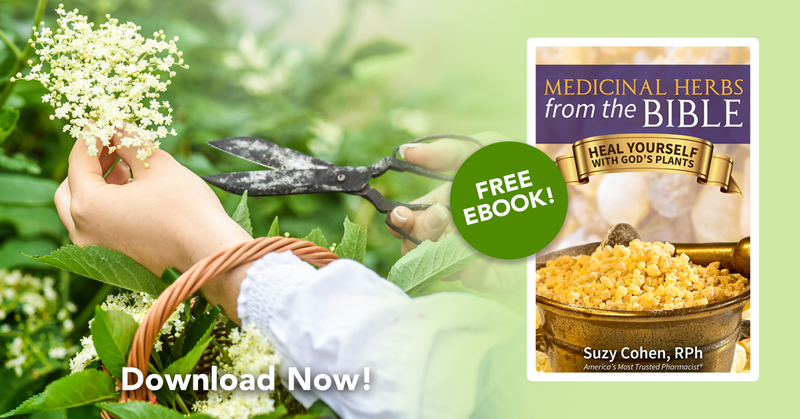 If you’d like to learn more about other natural remedies, click on the image below to get my FREE ebook, Medicinal Herbs from the Bible!